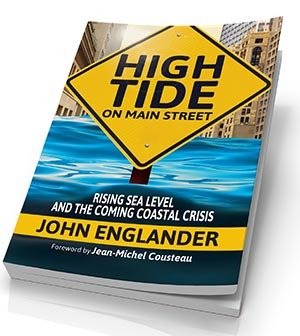 The additional tag line for this book, “Rising Sea Level and the Coming Coastal Crisis“, pretty much describes the story that unfolds even from the very early pages, although this book charts a somewhat different course, at least in the first half. With recent events such a Hurricane Sandy in mind, there is a tendency to focus on sea level rise as a short term or even “now” event. But our descendants may see vast changes in the shape of the coastline and the viability of the great cities for hundreds and perhaps thousands of years to come as a result of the change in atmospheric CO2 that today’s society will hand on to them. That is what this book is really about. The author of this book, John Englander, takes the reader on a tour of the recent few million years, where sea level has shifted by tens of metres in response to relatively modest changes in global temperature and CO2 levels. These are changes that sit within the range that CO2 levels have moved in the last century or are similar to the temperature swing that is expected to play out over the coming century (even the hoped for 2°C limit). Englander builds a strong case that rising sea level is the single aspect of the current warming that will profoundly impact civilization. This is a message that very few people really get, given the myopic view we tend to have on events. We hear much about the current 3+ mm rise in sea level per annum and the forecasts of 0.3 metres to 1 or 2 metres change over this century, but according to Englander this is just the beginning. The slow changes in ice sheet coverage in response to small shifts in global temperature have caused sea levels to rise and fall by up to 100 metres. The last ice age saw sea level some 125 metres lower than today (for a 5 deg.C lower global temperature) and the warming peak during the previous inter-glacial some 125,000 years ago had sea level topping out some 8 metres above current levels. Estimates vary, but there is good evidence to indicate that sea level and global temperature move together at about 10-20 metres per degree C. It’s just that sea level, because of the size of the ice sheets, moves on a millennial rather than annual time scale and takes a very long time to equilibrate. This is interesting material and Englander does a great job of sharing the evidence and explaining the dynamics, but fifty pages or so into the story and it starts to run out of steam. It’s not a difficult case to make with the wealth of paleoclimate data that is available, but once made that is pretty much it. The book then turns its attention back to this century and the remainder of the story looks at individual cities, immediate government responses (or lack of them) and threats to infrastructure, population bases and low lying countries. It is solid stuff, but not up there with the first half. One interesting teaser is some speculation about mega-projects that may arise in the centuries to come, for example damming the Straits of Gibraltar to protect the coastline of the Mediterranean and Black Sea. Built across the shallowest part of the straits, such a project doesn’t defy imagination. The book is an interesting read and worth having a look at, if for no other reason than to better understand the real legacy that we may well be leaving our descendants. Can a technology specific policy exist in a carbon market? I used to think that a few centimeters — or even a meter or two — this century would be unnoticeable, but then I read Jim Hansen et al explanation that 400- to 50-million years ago (more or less, it’s irrelevant actually) the sea level was some 78m higher than today before the CO2 concentration in the atmosphere descended from 2000ppm to 1000ppm (long before the existence of life as we know it) down through 425ppm +/- 75ppm and ICE FORMED ON PLANET EARTH. Before that, it was too warm for ice. And before ice, the oceans were roughly 280′ higher (more or less, it doesn’t really matter exactly). What is interesting to ponder is given the fact that CO2 is now right at 400ppm and now rising about 2.07ppm per year according to http://bit.ly/2ppmCO2 (and accelerating), what will happen in the next 12-15 years when it passes through 425ppm again. Probably nothing noticeable because of the inertia in the massive ice sheets. Will we shrug it off and say we need more studies and more data to conclusively determine how the models match the observations? That is what Rex Tillerson would probably say, judging from his comments at the most recent Shareholders Meeting (http://bit.ly/REVvREX10June) and I am sure other CEOs of petroleum companies. What would Peter Voser say? Given one set of curves (http://LetsGetGoing) that suggest we have already missed one opportunity (the green curve), I believe you should orchestrate a meeting with Peter Voser and Rex Tillerson to talk about announcing 1) he first symbolic refinery retirement, 2) a freeze on financing for fossil fuel infrastructure projects and expanded production, 3) and a shifting of investment to capital projects that expand renewables — a 100% shift. Let the viable hydrogen, algae bio-fuels and other solar-based fuel technologies surface. The return on investment will be there soon, if not immediately — but don’t let that be the only criteria for moving forward. We cannot afford to require a threshold ROI when the stakes are so great. One possible outcome of miscalculating the future relative costs of energy and inaction by the large oil corporations is to risk viability by being exclusively dependent upon hydrocarbons when the public demands carbon-free energy and cries out against you. Put that scenario into the economic and linear programming models Exxon, Shell and the rest run. I used to think that I needed a quick payback or high ROI to justify solar installation on my roof, but recently I realized that it is prudent to install solar on rooftops irrespective of payback (using today’s assumptions) because the assumptions we make today will be obsolete very soon. We have nearly run out of time. I really don’t think Rex gets it. Perhaps Peter does. Together, perhaps, they could be the catalyst to get the industry out of the old paradigm and begin anew.